We have to reclaim time itself, wrenching it from the “time is money” maximum efficiency, and make room for it to flow the other way – towards us. We must take time back into ourselves to let our consciousness breathe and our cluttered minds be still and silent. This is what art can do and what museums can be in today’s world. 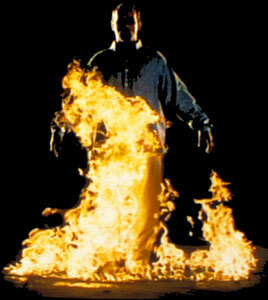 Bill Viola’s The Crossing is a room-sized video installation that comprises a large two-sided screen onto which a pair of video sequences is simultaneously projected. They each open in the same fashion: a male figure walks slowly towards the camera, his body dramatically lit from above so that it appears to glow against the video’s stark-black background. After several minutes he pauses near the foreground and stands still. He faces forward, staring directly into the lens, motionless. At this point the two scenes diverge; in one, a small fire alights below the figure’s feet. It spreads over his legs and torso and eventually engulfs his whole body in flames; yet, he stands calm and completely still as his body is immolated, only moving to raise his arms slightly before his body disappears in an inferno of roaring flames. On the opposite screen, the event transpires not with fire but with water. Beginning as a light rainfall, the sporadic drops that shower the figure build up to a surging cascade of water until it subsumes him entirely. After the flames and the torrent of water eventually retreat, the figure has vanished entirely from each scene, and the camera witnesses a silent and empty denouement. The Crossing makes use of Viola’s signature manipulation of filmic time. Like many of the artist’s recent works, it was shot using high-speed film capable of registering 300 frames per second, thus attaining a much greater level of detail than would be discerned by the naked eye. In postproduction, Viola reduces the speed of playback to an extreme slow motion—further enhancing the level of definition to a dramatic and scrutinizing effect. The Crossing might be interpreted through the lens of mythology or religious thought, even though the work does not make iconographic or stylistic reference to a particular narrative. Viola has been inspired by a rich variety of spiritual traditions, including Catholicism, Hinduism, Buddhism, and Sufism. 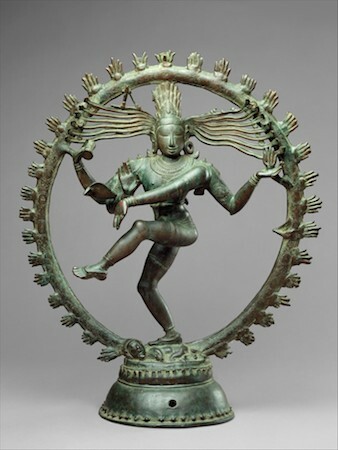 Viewers may recall, for instance, the ring of flames that surrounds images of Shiva Nataraja (left) in which he sets in motion the continuous cycles of creation and destruction through his cosmic dance, or the biblical tales of fire and brimstone, rapture and the Great Floods. Throughout such narratives, the elemental forces of fire and water often symbolize change, redemption, transformation and renewal— common themes in Viola’s oeuvre. The artist has similarly made reference to transitions and passages in works such as The Passing, a 1991 video made shortly after his mother’s death, or Two Women, a 2008 piece in which figures slowly move through a translucent and symbolic barrier of water. Viola’s education and artistic practice have long been guided by questions of “how we see, how we hear, and how we come to know the world.”  The artist grew up in Queens, New York and attended Syracuse University in the late 1960s where he enrolled not only in fine arts classes, but also in a variety of academic subjects ranging from the humanities to the hard sciences. In particular, he was captivated by religious studies, psychology and electrical engineering, interests that are clearly assimilated throughout his oeuvre. As early as the 1970s, Viola was one of the first visual artists to make use of new video technologies. As a student he experimented enthusiastically with new portable recording devices, with which he created short video performances that explored a variety of gestures, sounds and expressions. During the 1970s and 1980s, he was artist-in-residence at a number of media laboratories and television stations, while also serving as an assistant curator at Everson Museum of Art where he was exposed to the work of Nam June Paik and Peter Campus, artists who were early innovators in the emerging field of video art. Eventually, Viola conceived of multi-channel and immersive installations where viewers are surrounded by carefully arranged screens and projections, sometimes displayed within an otherwise pitch-black room. Between 1974 and 1976, Viola lived in Italy, where religious paintings and sculptures are often displayed in-situ, in the cathedrals for which they were commissioned. The continuing integration of historical art into contemporary public and religious life inspired Viola to design installations that mimicked the forms of devotional paintings, diptychs, predellas and altarpieces—formats that encourage intimate contemplation of religious icons. Later traveling throughout Japan and other parts of East Asia, Viola observed the same active level of engagement with art. In Tokyo, for instance, he witnessed museum visitors placing offerings at the feet of sculptural bodhisattvas or other religious statuary. For viewers, the experience of viewing Viola’s works need not be spiritually inscribed. In many cases, his works appeal to or reflect raw human emotions (the theme of his acclaimed exhibition The Passions) or universal life experiences. While The Crossing can be interpreted in light of a host of religious associations, the act of “self-annihilation” represented in the figure’s disappearance at each conclusion also serves as a metaphor for the destruction of the ego. In the artist’s words, this action “becomes a necessary means to transcendence and liberation,”  especially in the face of life’s inevitable unpredictability. 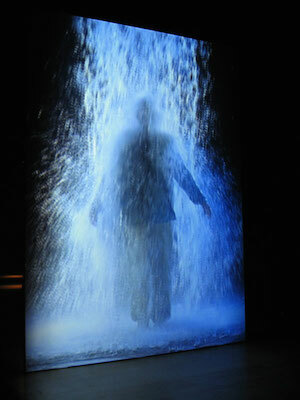 Bill Viola, Buddha Mind, p. 254. “Bill Viola Interviewed by John Hanhardt, Going Forth By Day (Berlin: Deutsche Guggenheim and New York: Harry N Abrams, Inc, 2005), p. 87. Bill Viola, as quoted in “Emotions in Extreme Time: Bill Viola’s Passions Project,” in The Passions, John Walsh, ed. (Los Angeles: Getty Publications, 2003), p. 53. Cite this page as: Dr. Allison Young, "Bill Viola, The Crossing," in Smarthistory, August 9, 2015, accessed April 22, 2019, https://smarthistory.org/bill-viola-the-crossing/.